No more breakdowns or down time! Only great, fast, reliable service – that’s our commitment! 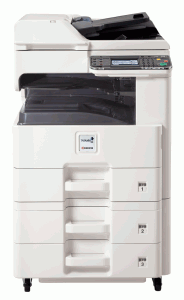 World Trade Copiers and World Trade Office Solutions offer the very best of your copier needs. That’s what’s led us to grow since 1983. We provide service you can rely on and machines that provide true quality. We commit to sending an onsite technician to fix any problems within 4 hours of any service call on any business day. We employ our own team of techs to ensure this. This is what has allowed us to succeed since 1992. You want service? Well here’s service for you. At World Trade Copiers, having well-trained technicians and fixing machines is a given. We’re about much more than that. We believe it’s our responsibility to bring you experience that no other company can offer by being expert in our own technology while at the same time having command of what companies similar to your own are doing. So when working with WTC, you’ll never have to worry about whether your technology is on par with your competitors. We’ll do all the research and lay your options out on the table for you. No more worry. Bases covered. An inefficient document strategy can allow little costs to build up over time, potentially causing dramatic losses that often go unseen. How does your company deal with its documents? Using our expertise, World Trade Office Solutions will perform an onsite Document Workflow Analysis at your office to determine your company’s current costs, information flow, and measure processes, as well as look at future expectations associated with your documenting needs. After assessing the expenses of your documents at all stages – during creation, storage, distribution and more, we provide you with a summary which details areas in which dramatic improvements can be made. This is your document strategy, your roadmap to office efficiency. From here on out, it’s smooth sailing. Technology shouldn’t be hard. 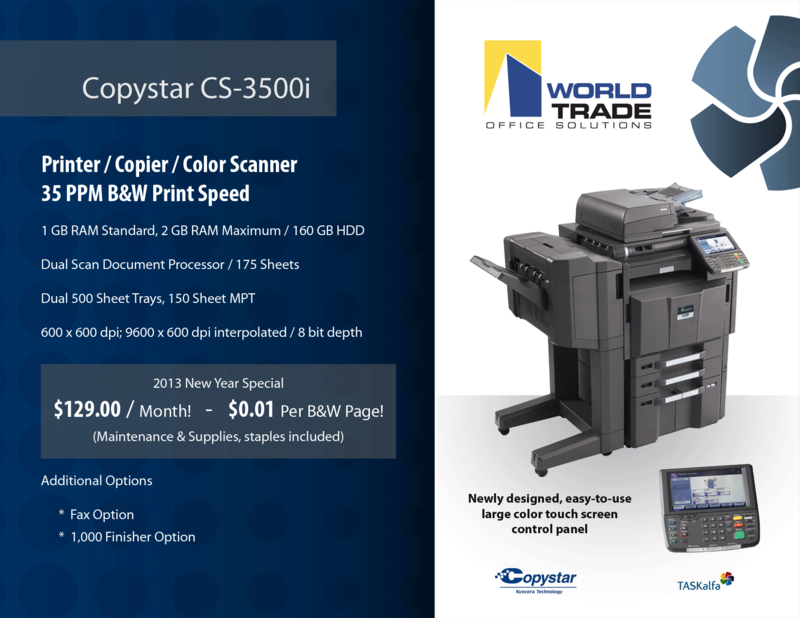 At World Trade Copiers, we feel that the technology we provide should be simple for you to get. That’s why we have a full range of flexible financing options – in order to make sure the technology we provide is as easy and convenient as technology should be. At World Trade Copiers we work to understand your objectives as our client, along with the business trends that will affect your industry in the future. We look ahead in order to provide you with the most cost-effective equipment that supports your company’s current objectives and long-term goals, and work with you to develop the most convenient financing solutions that suit your needs. We work with some of the largest financial institutions in the world and work hard to get our clients the best rates to complement their payment arrangements. So whether your company is new and has not yet established credit or if you are simply trying to make special arrangements for your payment, talk to our in-house financial experts. Once again, we’re here to make this easy. Businesses obtaining income-producing equipment might be interested in our deferred lease program. With this program, you have up to 90 days to use your new equipment before your first payment is due. With the step lease program, your start with small payments which then increase to normal payments, allowing you the time to incorporate your new equipment into your workplace without having to worry about the sudden financial impact of immediate, significant monthly payments. This program is especially useful for businesses with equipment acquisitions beyond $50,000. 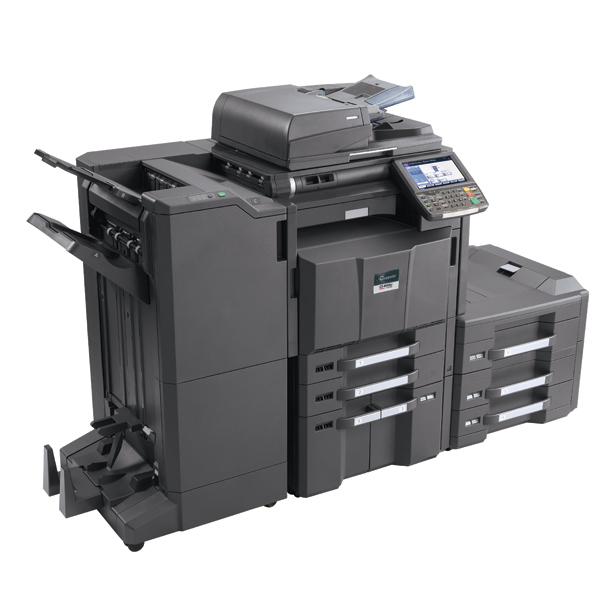 If your copy volume is high and the cost of the equipment seems higher, the Cost Per Copy lease might be best for you. This lease allows the client to pay only a small per-copy charge based on the overall volume, paying only for what you copy/print every month. This lease is popular with seasonal businesses as we can set up a payment schedule that is due only during certain months, allowing you to match your monthly payment schedule with the time periods that are most comfortable for you. It happens on occasion that businesses have to change their decisions regarding their office equipment acquisitions for financial reasons. This program allows you to translate your investment into cash. With all our plans, you have various buyout options to choose from at the end of the term. Other custom programs are available at no extra cost. Did you know some of the many pros of leases over loans? Did you know that with a lease you have to complete only one form, while a bank loan requires many forms, along with tax returns and hundreds of other documents? Or that you will likely know in less than 2-4 hours whether you are qualified for a lease, whereas with a bank loan, the decision can take a few weeks? Did you know that a lease will provide you with 100% financing, while a loan generally covers only 20-30% of your total cost? Additionally, a lease calls for 0-2 months down payment, while a bank loan typically requires 50-70% of your total project cost. Did you know leases have fixed interest rates and fixed payments, while bank loans usually have adjustable rates? With leases, financial statements are not obligatory up to $150,000, while financial statements are required for bank loans on nearly all transactions in excess of $10,000 and banks tend to require yearly updates to maintain the loan. Were you aware that sales tax is not required to be reflected on your balance sheet with a lease, but with a loan, it is recorded on your balance sheet as a debt? And did you know that loans have hidden requirements like compensation balances, other bank charges and loan covenants, while leases have no such requirements and no lease termination costs? 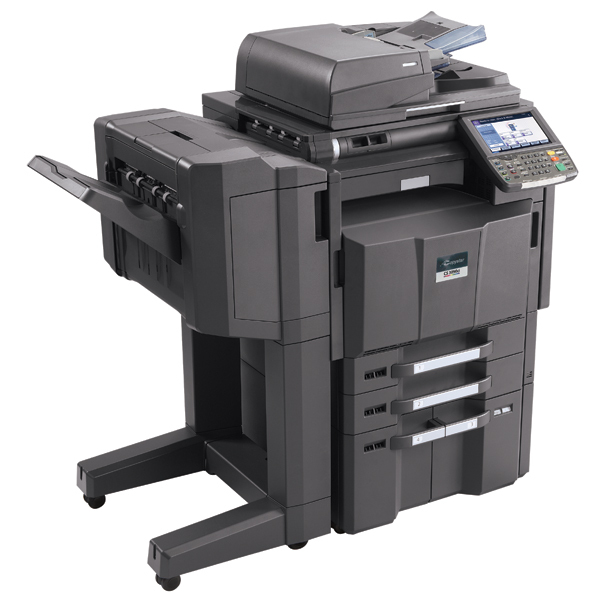 When it comes to copier lease, Ft. Lauderdale businesses make the smart choice when they go with World Trade Office Solutions. There are other benefits to leasing, too – such as tax benefits. Leases are usually 100% deductible over the term of the lease, while loans are depreciated over the IRS’s useful life of the equipment. Additionally, leases free up your cash, allowing you the means to further invest in your business. Loans, on the other hand, restrict your funds, possibly preventing investment opportunities which may present themselves. For information about our Services email us service@copiersflorida.com.